Due to the high sensitivity of machines and vehicles used by the government, many facilities have need for bird control services. These services can range anywhere from Pigeon control and Seagull control to clean up of hazardous bird droppings. Finding the most effective means of preventing pest birds of any size from accessing warehouses, roof ledges, or parking structures is BirdBusters area of expertise. Our staff has worked with architects and building engineers to design/build bird control programs that are effective, aesthetically pleasing, and still fall under required budgets. Bird control methods for government facilities vary based on the particular bird and problem area. BirdBusters has over 30 years of experience finding and determining the best method of control. When coming up with a comprehensive program for a property our technicians are trained to locate the current nesting/landing locations as well as trouble shoot for potential new ones. When a physical barrier is installed, birds will look for a new location to inhabit. It is important for the prevention of a new problem arising to not only treat the existing problem, but also be able to predict the bird�s habits and eliminate access to potential nesting sites. When implementing a comprehensive program, several types of bird control products or devices may be used. Our technicians are trained to create the most effective system for the buildings unique needs. Many times this means using electrified bird deterrents in conjunction with netting or spike, or a combination of other products. 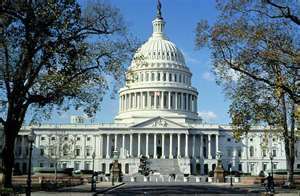 Many government buildings are located on or near the coast where Seagulls can be a large problem. Seagull droppings will, over time, corrode roof tops and generally result in costly repairs or complete replacements. 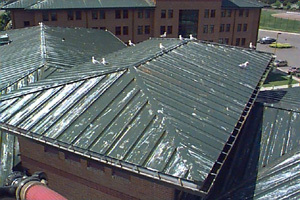 Learn More� Preventing the birds from landing in the first place will greatly increase the lifespan of the roofs. Since these birds are protected under the Federal Migratory Bird Act, they cannot be removed or harmed in any way. Overhead wire systems are used in these situations to prevent the Seagulls from being able to comfortably land or take off. BirdBusters has designed many of these overhead wire systems for government facilities in the past. Using a specially designed post, our technicians are able to create an effective wire system without putting holes in the roof, therefore keeping the roof warranty intact. The system may also be painted to match the surrounding structure to limit the visibility of the system from the ground. 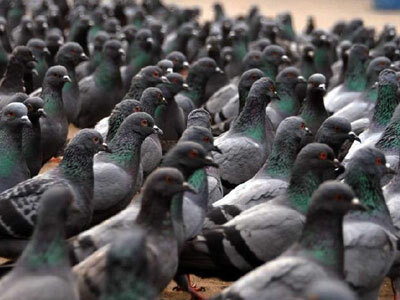 Pigeons like to nest in areas that are shielded from the elements as well as predators. Small nooks, warehouses, and parking garages are all places that pigeons will build nests if given the opportunity. 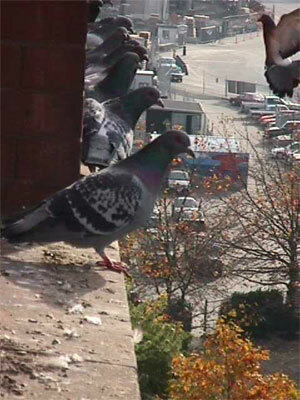 Learn More�As with other birds, Pigeon droppings spread disease and cause damage to equipment. It is important to install a barrier that will prevent these birds from accessing landing and nesting sites. BirdBusters will evaluate the structure and create a specially designed system for the buildings particular needs. 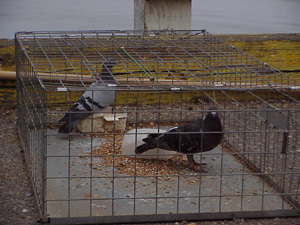 An integrated Pigeon system may include bird netting to prevent birds from accessing large areas, as well as Spike to ledges that are outside the nets range. Light fixtures and pipes may be spiked or a wire system may be installed to keep birds from landing. This keeps the bird droppings from landing in personnel work areas or on machinery. Cleaning - When birds have been nesting in buildings, attic spaces or even just hanging out on the roof, droppings will accumulate. 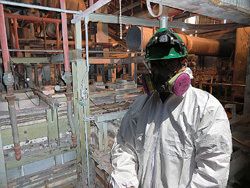 It is important to have a trained professional that has the appropriate safety gear and knowledge to clean and properly dispose of the droppings. 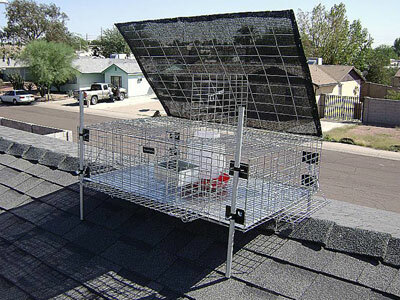 When an adequate bird control system is over budget, using live traps to remove the existing problem is an effective alternate means of bird removal. When warehouses or parking garages only have a small population of birds, weekly visits can effectively reduce or eliminate the bird population in a cost effective manner. Live bird removal - Some situations require that birds be removed by non-lethal means. Small birds that are protected under the Federal Migratory Bird Act may fly into offices or other areas where sensitive equipment is kept. When one of these situations occur, BirdBusters has a program to safely remove the bird without harming it. Ledge deterrents- Birds that are perching on high visibility ledges may be deterred from landing using low visibility products. Electrified bird deterrents such as Fly-Bye�s Shockstrip are placed on the edge of ledges and only sits about �� high. This deterrent is highly effective in deterring all species of birds from landing on surfaces.